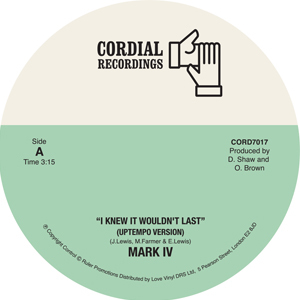 Mark IV were from New York and released one album on Mercury Records in 1974 until we released their second in 201b called ‘Signs Of A Dying Love,’ which was a collection of unreleased songs recorded in the mid 1970s. There were two versions of the song ‘I Knew It Wouldn’t Last.’ We featured the midtempo version on the album and the other was an exclusive play for Soul Sam, Lars Bulnheim and Steve Clancy for the past eighteen months. We’ve coupled the release with the popular ballad ‘I Got Everything’ which was featured on the flip. IN STOCK – w/c 22/4/19 – Pre-Order your copy now for delivery as soon as they arrive.